It’s an idea that’s been thrown around in the science fiction world for decades: a robotic, high-tech home that makes lives easier, more organized, and safer. Remember the Jetsons? Well, with the rise of smart homes, that world is quickly becoming a reality. What is a smart home, though? One of the defining features of a smart home is the ability to be mostly automated, making it easier to just check settings and then forget about them. Smart home automation is perhaps one of the most common reasons for people to choose smart devices in their homes: it makes day-to-day living more convenient and far easier than before. The idea of a computerized, automated house is no longer simply a work of fiction. 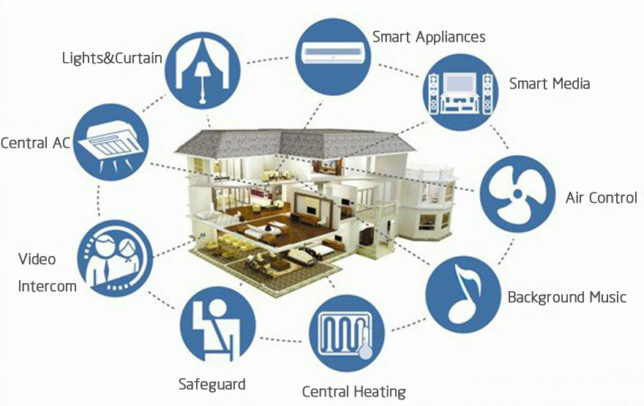 With the right devices, you can have a smart home for yourself! And, the conveniences make it well worth the effort you put into it. Without a doubt, security is the most important issue to many people when it comes to their homes. If you don’t have security in your living space, then you’re not going to be comfortable enough to actually enjoy it. That’s why one of the first major items that most people decide to bring into the twenty-first century is their home security system. As well as the standard home security system, you can now choose to have cameras set up throughout your home that you can monitor from anywhere just by using a smartphone. Not only can you be alerted quickly and easily if there’s something suspicious, but you can also keep an eye on pets and people that are in your house. But, safety from other people is only half of the battle. In order to be completely secure in your own home, you need to be safe from accidents as well. Everyone knows that it is absolutely vital to have smoke and carbon monoxide detectors in your home. But, knowing that and making sure that they’re there (and in working order) are two completely different things. A smart home can take care of that. There are devices that can monitor the house for smoke and carbon monoxide and will let you know very loudly if there is a problem that you should be worried about. And, if you’re away from home when a fire starts off, you can get alerts sent to your phone. Keeping a kitchen stocked and ready for use is one of the most time-consuming chores that people are faced with. Making sure to keep an updated list of what has been used and what is expiring can be a trial in and of itself. That’s why so many smart home conversions start in the kitchen. The main task that most smart home upgrades in the kitchen tackle are the ability to keep track of what you have and what you need. How many times have you gone to the grocery store only to forget what you had in the fridge? Well, if you have a smart fridge, there’s a good chance you can just pull out your phone and take a look there! Smart homes technology in the kitchen means that traditional lists are a thing of the past and something that you can put in the back of your mind. There’s more to the kitchen than just list-making, of course. You’ve got to cook sometime, and smart kitchens have definitely taken that into consideration. Do you like using crock pots? There is now a smart one, which makes it easier than ever to adjust from wherever you might be. Can’t start your day without coffee? Or, what if you’ve decided to invite someone over for a cup after work? With a smart coffee pot, you can start the drip before you even leave the office from your smartphone. One of the most tricky subjects in any home is the thermostat. While you want to be able to feel comfortable in your house, you also don’t want to use too much electricity; the bill alone is enough to give some people nightmares. But, finding a good way to control the temperature of a home used to be difficult. Now, all that’s needed is to update your house with a smart thermostat. A smart thermostat works mainly by allowing you to adjust the temperature from wherever you are using nothing but your smartphone. This has a lot of great uses: you can start up the air conditioning so that the house is cool when you arrive, or you can turn off the heat if the weather warms up while you’re gone during the day. Being able to change temperatures on a dime, regardless of where you are, is a convenience that, once used, you won’t be able to be without. But, it can go beyond just being able to adjust your thermostat from across town, of course. One of the main reasons why people prefer smart homes is for their automation. You can set up a schedule on your thermostat that can help you save money. With a few specifications, you can have your thermostat turn off during the day while you’re gone but turn back on when you come home. Electricity is saved, and you remain comfortable. Lighting is another big electrical leech that causes strife amongst families and roommates. Normally, the best way to avoid using too much power is to simply go through the house and make sure that all of the lights are off before leaving. But, that can be time-consuming as well as being difficult to remember. And then, when you make a mistake, tensions rise. But, with a smart lighting system, overlooking the lights can be a thing of the past. You won’t have to wander the house before leaving hoping to not forget a light: simply take a look at your phone and make sure. Is there a bulb still burning somewhere? Then, with a single tap, you can turn it off from wherever you are. For those who struggle to remember to turn off the lights before leaving, this is a vital tool. This is also a great idea for those who don’t like to try to feel their way through their dark house to the nearest light switch after a long day: just turn on the lights from the car. And, as always, automation is key here and will make your life even simpler. Instead of just turning the lights on and off from your phone every time you leave, you can set up a schedule and let the lights simply turn themselves off whenever it’s time for you to leave the house. Then, afterward, they turn themselves on when you return. It’s quick, simple, easy, and will stop you from running up an electricity bill. Sometimes, when you’re busy, you just need to be able to ask someone to do something and have them do it. It might be something as simple as putting on music while you wash dishes or telling you what the weather will be like that afternoon while getting the kids ready for school in the morning. That’s where digital assistants come in. Most of us are at least passingly familiar with digital assistants at this point. These include Siri, Alexa, and Google Home three of the most famous and widely-used digital assistants in the world. With a smart home, these two, as well as others, are now no longer stuck in your phone. Instead, you can have them waiting in the wings for when you need something at home! Being able to just ask a question or state a command, then have it followed through on means that you won’t have to stop what you’re doing to do it yourself, letting you get more done with less effort. But, that’s just the beginning. As the technology needed for smart homes progresses, we’re seeing that more of these systems are able to interact with one another. This already shows as these digital assistants can control some of the other smart home innovations that you’ve brought into your life. As time progresses, you’ll be able to control more and more of your house with just a few words. As of now, the convenience of using one of these assistants means less conscious effort on your part. The rise of the smart home is making it simpler than ever to live your life. Smart home automation means that you’ll be able to set up a schedule or timer to control basic functions, keeping things simple and convenient for you. You’re also safer with advanced security systems, smoke detectors, and carbon monoxide alarms. In the kitchen, list-making and cooking are becoming easier than before. And, throughout the entire house, a digital assistant is always waiting, ready to answer your beck and call. So, how does a smart home work? It works by taking the guesswork and effort out of running your home so that you can pay attention to more important things.